Dubai police have found at least 3,000 automobiles -- sedans, SUVs, regulars -- abandoned outside Dubai International Airport in the last four months. Police say most of the vehicles had keys in the ignition, a clear sign they were left behind by owners in a hurry to take flight. It is believed that the owners of these vehicles are mostly foreign workers from South Asia who have lost their jobs after Dubai's real estate crash, according to a DNA report. Dubai and other GCC countries are planning deficit-spending to stimulate their economies in 2009. Dubai will raise its budget by 11% for fiscal 2009. The city-state's finance department estimates the new spending will result in a modest fiscal deficit, Dubai's first ever. Other Gulf governments, including Saudi Arabia and Oman, have announced recently they will risk deficits next year instead of cutting back on spending, according to the Wall Street Journal. Analysts have raised concerns about the large debt load Dubai has taken on in recent years to finance its explosive growth, mostly in real estate. Dubai is one of seven semiautonomous emirates that make up the United Arab Emirates. Credit-rating agencies recently have revised downward the outlook -- and in some cases, the credit rating -- for a handful of Dubai-controlled corporations. Dubai doesn't have its own sovereign-debt rating. The city-state doesn't pump much oil itself, so it has depended on attracting foreign investment, especially from its oil-rich neighbors, and borrowing to finance growth. The contagion that started on Wall Street in 2008 is fast spreading around the globe. The deepening recession in the United States and the end of speculative bubble has brought the oil price down to below $40 a barrel, down from $150 a barrel a year ago. The US consumer price index dropped 0.7% in December, 2009 from the previous month. Consumer prices rose just 0.1% compared to December 2007, the lowest calendar-year increase since 1954 and well below the Fed's 1.5% to 2% preference over the long run. The CPI swelled 4.1% in 2007. The core CPI, in contrast, was up 1.8% last year, though it did fall 0.3% on an annual basis during the fourth quarter. A large number of families in Bangladesh, Sri Lanka, India, Nepal and Pakistan depend on remittances of tens of billions of dollars from workers in the oil-rich states. Emaar in India and Pakistan are likely to be delayed or scrapped. While the oil price declines are going to spell significant relief for South Asians, the loss of remittances and foreign investments will also hurt their economies. It's too early to tell if the net effect will be positive, negative or zero. It is sad to see yet another booming economy going down. It proves the fact that any economy having the foundation of "interest" will go down. This is the right time to do away with riba and start again with the way that out great religion tell us to follow. The United Arab Emirates is delaying or canceling real-estate projects worth more than $260 billion amid falling demand and deteriorating market conditions, according to a new report by investment bank Morgan Stanley (MS). The bank, citing data from Zawya.com, says $263 billion worth of projects in the U.A.E. have been delayed or canceled, "with all the recently announced mega projects, including Meraas Jumeirah Gardens , valued at about $98 billion and Nakheel's Harbour project, estimated at $38 billion, put on hold." The report, released earlier this week, says lower oil prices, the global recession, tighter liquidity, job cuts and the absence of speculators have all put pressure on the sector, forcing developers to review project requirements. "All of these factors have resulted in a worse than expected performance in the U.A.E. property market, especially in Dubai , which is also facing potential oversupply," the report says. "In the fourth quarter of 2008, property prices corrected sharply downwards,rental rates eased in Dubai and there was an increase in the rate of announced projects delays/cancellations," it adds. At the end of 2008, approximately $1.25 trillion worth of construction projects were underway in the U.A.E., according to London-based Middle East Economic Digest. However, as the region's once-booming real estate market slumps amid falling prices and a growing number of layoffs in the construction and financial sector, some of the Emirates' leading developers are being forced to review project requirements. Morgan Stanley says property prices in Dubai have fallen by an average of 25% and 20% in Abu Dhabi since their peak last September. "The biggest drop has been in the high-end property segment, with average prices down 1% in 2008 and 35% since the peak," the report says. Last week, HSBC (HBC) said Dubai is delaying or canceling almost 60 projects worth $75 billion, particularly in high-end residential and commercial developments. In its note on Arabtec Holding , one of Dubai 's largest construction firms, HSBC lists 59 projects that are currently under review, including eight that have been canceled. palm-tree-shaped islands off the Dubai 's coast. The report also lists Meraas Development's Jumeirah Gardens City project,also announced in October, on hold. Five projects at the $110 billion Dubailand development, which was billed to be the pinnacle of the Dubai 's tourism draw, are on hold or canceled,including the $2.2 billion Universal City development that was destined to be one of the world's largest theme parks. The HSBC report said The Falcon City of Wonders project that was to include a replica of The Eiffel Tower, The Tower of Pisa and The Taj Mahal amongst other "wonders" of the world has been canceled. DUBAI, United Arab Emirates — Sofia, a 34-year-old Frenchwoman, moved here a year ago to take a job in advertising, so confident about Dubai's fast-growing economy that she bought an apartment for almost $300,000 with a 15-year mortgage. "I'm really scared of what could happen, because I bought property here," said Sofia, who asked that her last name be withheld because she is still hunting for a new job. "If I can't pay it off, I was told I could end up in debtors' prison." With Dubai's economy in free fall, newspapers have reported that more than 3,000 cars sit abandoned in the parking lot at the Dubai Airport, left by fleeing, debt-ridden foreigners (who could in fact be imprisoned if they failed to pay their bills). Some are said to have maxed-out credit cards inside and notes of apology taped to the windshield. No one knows how bad things have become, though it is clear that tens of thousands have left, real estate prices have crashed and scores of Dubai's major construction projects have been suspended or canceled. But with the government unwilling to provide data, rumors are bound to flourish, damaging confidence and further undermining the economy. Instead of moving toward greater transparency, the emirates seem to be moving in the other direction. A new draft media law would make it a crime to damage the country's reputation or economy, punishable by fines of up to 1 million dirhams (about $272,000). Some say it is already having a chilling effect on reporting about the crisis. Last month, local newspapers reported that Dubai was canceling 1,500 work visas every day, citing unnamed government officials. Asked about the number, Humaid bin Dimas, a spokesman for Dubai's Labor Ministry, said he would not confirm or deny it and refused to comment further. Some say the true figure is much higher. "At the moment there is a readiness to believe the worst," said Simon Williams, HSBC bank's chief economist in Dubai. "And the limits on data make it difficult to counter the rumors." Some things are clear: real estate prices, which rose dramatically during Dubai's six-year boom, have dropped 30 percent or more over the past two or three months in some parts of the city. Last week, Moody's Investor's Service announced that it might downgrade its ratings on six of Dubai's most prominent state-owned companies, citing a deterioration in the economic outlook. So many used luxury cars are for sale , they are sometimes sold for 40 percent less than the asking price two months ago, car dealers say. Dubai's roads, usually thick with traffic at this time of year, are now mostly clear. "Why is Abu Dhabi allowing its neighbor to have its international reputation trashed, when it could bail out Dubai's banks and restore confidence?" said Christopher M. Davidson, who predicted the current crisis in "Dubai: The Vulnerability of Success," a book published last year. "Perhaps the plan is to centralize the U.A.E." under Abu Dhabi's control, he mused, in a move that would sharply curtail Dubai's independence and perhaps change its signature freewheeling style. But Dubai, unlike Abu Dhabi or nearby Qatar and Saudi Arabia, does not have its own oil, and had built its reputation on real estate, finance and tourism. Now, many expatriates here talk about Dubai as though it were a con game all along. Lurid rumors spread quickly: the Palm Jumeira, an artificial island that is one of this city's trademark developments, is said to be sinking, and when you turn the faucets in the hotels built atop it, only cockroaches come out. "Is it going to get better? They tell you that, but I don't know what to believe anymore," said Sofia, who still hopes to find a job before her time runs out. "People are really panicking quickly." Hamza Thiab, a 27-year-old Iraqi who moved here from Baghdad in 2005, lost his job with an engineering firm six weeks ago. He has until the end of February to find a job, or he must leave. "I've been looking for a new job for three months, and I've only had two interviews," he said. "Before, you used to open up the papers here and see dozens of jobs. The minimum for a civil engineer with four years' experience used to be 15,000 dirhams a month. Now, the maximum you'll get is 8,000," or about $2,000. "Before, so many of us were living a good life here," Mr. Thiab said. "Now we cannot pay our loans. We are all just sleeping, smoking, drinking coffee and having headaches because of the situation." Now, faced with crippling debts as a result of their high living and Dubai's fading fortunes, many expatriates are abandoning their cars at the airport and fleeing home rather than risk jail for defaulting on loans. I hope to god these South Asian will go back to there own country. Stocks slumped Friday as investors reacted to a debt crisis in Dubai, with more repercussions likely on tap the next few days as traders return from major holidays in both the U.S. and Middle East. Crude oil touched a six-week low, gold tumbled, and the dollar climbed as worried investors sought safe havens. The stock market's slide began in Europe, continued in Asia, and then through the U.S. trading session after Dubai said it would delay repayments on $60 billion of debt from its investment company, Dubai World. The decision raised broader questions about the safety of emerging-market debt and the strength of the global recovery The Dow Jones Industrial Average was off 233 points at its morning low and ended the shortened post-Thanksgiving session with a 154.48-point decline, off 1.5%, at 10309.92, hurt by declines in all 30 components. The Dow, which entered Friday's session at a 13-month high, ended the week down 0.1%, snapping a three-week winning streak. Traders and money managers drew some comfort from the U.S. market's recovery from its intraday lows Friday. Many point out that Dubai's main creditors are European banks, not Wall Street firms. But that could still lead to gyrations next week and beyond if investors with exposure to Dubai's troubles continue to unload commodities, U.S. shares, and other assets that have shown hefty gains this year to raise cash. "We still need to see if there's going to be a domino effect here," with Dubai's credit woes spreading to its neighbors and trading partners, said Kevin Shacknofsky, of Alpine Woods Capital Investors. "The markets are telling us for now that this is a containable problem, but we're not absolutely certain of that yet." In particular, traders are waiting to see details of possible aid from oil-rich Abu Dhabi to prop up Dubai. 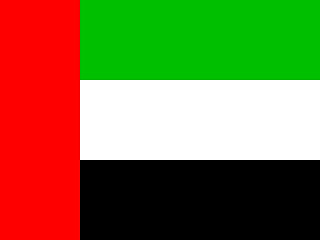 Both are city-states within the federation known as the United Arab Emirates, which was the world's eighth-largest oil producer in 2008, according to U.S. government data. Analysts said such a rescue may have to be hammered out in the coming days, since many key players in the Middle East are away Friday for the Eid Al-Adha holiday marking the end of the annual Muslim pilgrimage to Mecca. Trading was light in the U.S. on Friday, with many participants taking an extended Thanksgiving break. In Asia, Japan's Nikkei stock average slid 3.2%. Hong Kong's Hang Seng index tumbled 4.8%. South Korea's benchmark dropped 4.7%. The dollar rose, with the U.S. Dollar Index, which measures the greenback against a basket of six other currencies, up 0.2%. The euro fell to $1.4960, down from $1.5017 late Wednesday. Treasurys also gained. The two-year note was recently up 4/32 to yield 0.687%, while the 10-year note rose 17/16 to yield 3.207%. Friday's moves in the financial markets reverse a recent trend in which investors have generally favored riskier investments, reflecting optimistism that the world was coming out of recession. But now attention is turning not just to Dubai but also to Greece, which is scrambling to refinance its mounting public debt. default risk faced by Dubai World, Minister for Overseas Indian Affairs Vayalar Ravi said on Saturday. "There is no need to panic," the minister told media over the phone from Chennai, adding: "I have feedback from our consulate general in Dubai and our embassies there. We are not expecting any kind of exodus of Indian workers to India." According to Ravi, there was some impact in the Gulf region at the beginning of the meltdown last year but the situation had changed since then. "I even announced this in parliament. About 100,000 Indian workers had returned from Dubai at that time. But many of them have gone back now," the minister pointed out. "India won't be affected by Dubai's debts." The state-run Dubai World stunned the global financial world Thursday when it announced it would need to restructure its debt, estimated at $59 billion, to pre-empt default and asked creditors for a six-month deferment. The conglomerate has a host of companies under its fold with interests in a wide range of businesses such as realty, infrastructure, logistics and economic zones. It operates not just in the region but across a clutch of countries, including India. The total debt of Dubai as an emirate is estimated at $80 billion. There were some concerns in India among the families of expatriate Indians working in the Gulf since the region accounts for nearly half of the country's inward remittances worth $25 million annually. An estimated five million Indians work in the region. But key policy-makers like Ravi, Finance Minister Pranab Mukherjee, Commerce Minister Anand Sharma and Reserve Bank of Governor D. Subbarao have sought to calm the nervous, saying the impact on the Indian economy will be negligible. There are millions of poor, impoverished labourers from South Asia in the Gulf region. Indeed, the long-enjoyed boom that saw cities such as Dubai carve out a new niche for excess and opportunity was built on the backs of such migrant workers, who are often treated as little more than bonded labour. Drawn from India, Pakistan and Bangladesh and often paying hundreds of dollars to a middle man to secure a job, these workers – on arrival in the Gulf – find conditions are often atrocious and that they have virtually no rights. Many have complained of being prevented from leaving. The upside of the hardship for the large numbers of South Asians who make their way to the Gulf – Indians are said to make up more than 40 per cent of the population of Dubai alone – is the amount of money that gets sent home in remittances. Figures suggest that in 2007, Indians living in the Gulf sent a total of $27bn to their families. For some states, the money sent home is a considerable slice of the total economy. In Kerala, for example, such remittances make up around 22 per cent of the state's income. Speaking from Thiruvananthapuram, the state's finance minister, Thomas Isaac, said he believed that even if the Dubai crisis did not rock India in its entirety it would affect Kerala "very much". "Half of the workforce in the United Arab Emirates are Malayalis [people from Kerala] and it seems certain that the construction activity in Dubai is going to take a hit," he said. "The impact is that the Dubai real estate market will decelerate." Mr Ravi, the central government minister, did not agree. Having spoken with Indian consulates in the Gulf, he said authorities believed that while the Dubai World crisis would have international implications, it would not lead to large job losses for migrant workers. He said, however, that despite such an assessment, the government was planning to announce a comprehensive package to rehabilitate those Indian workers who do return from the Gulf. "It will take some more time to operationalise the fund," he added. But for Sajid and his friends in Meerut, in the state of Uttar Pradesh, the harsh reality has already struck. Another migrant labourer who had lost his job in Dubai, Noor Mohammed, wept as he told the Times of India: "We had wanted to save money to get our families to the UAE. Our dreams lie shattered."